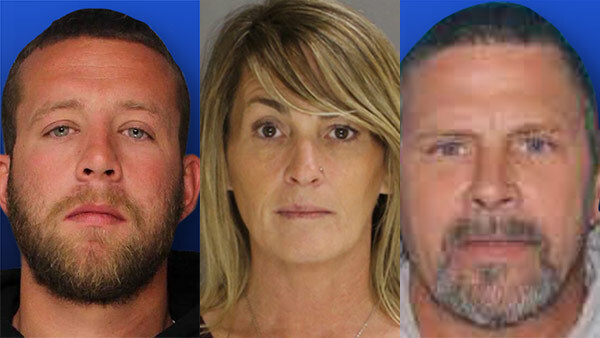 Barry Baker, Jr. / Denise Schmidt / Barry Baker, Sr.
WEST CHESTER, Pa. -- In the span of just over one month, a man, his fiancee, and his father have all been arrested on separate charges in Chester County. It all began around 2:30 a.m. on Wednesday, May 10, outside a 7-Eleven convenience store on the 200 block of South High Street in West Chester. Surveillance video, which was released on May 22, showed a 22-year-old man with cerebral palsy pulling up to the store in a white SUV. 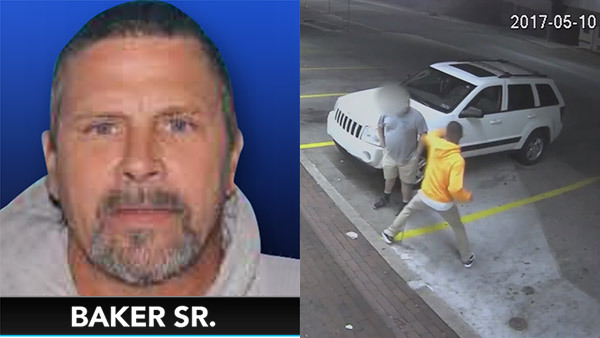 A man has been arrested for the assault of a disabled man in Chester County that was caught on video. That's when a man in a yellow sweatshirt, identified by investigators as 29-year-old Barry Baker Jr. of Georgetown, Delaware, appeared to mock the victim after he went inside. A few minutes later, the victim walked out of the store and the suspect apparently mocked him again. The suspect then followed the victim into the parking lot and punched the man in the face. The victim stumbled backward over the hood of his SUV as the man identified as Baker walked away. The 22-year-old victim composed himself, got into his vehicle, and drove away. Police say he then contacted police. Following the release of the surveillance video, Barry Baker Jr. was arrested and charged with simple assault and related crimes. Nearly a month later, on Tuesday, June 27, Baker Jr.'s fiancee Denise Schmidt was arrested. She was charged with hindering apprehension. On that same day, Chester County District Attorney Tom Hogan announced 46 people were charged in Operation Wildfire, an 8-week-long investigation targeting street-level heroin and opioid dealers. More than three dozen people have been charged following an undercover drug investigation in Chester County. Among the nearly four dozen arrested was Barry Baker Sr., the father of the suspect in the West Chester attack. "So while his son was beating up a man with a disability, Barry Baker, Sr. was selling us morphine. It's a heck of a family," Hogan said.